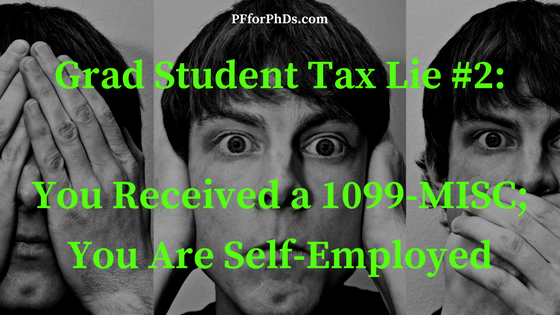 Grad Student Tax Lie #2: You received a 1099-MISC; you are self-employed. Short answer: No, graduate student stipends are not self-employment income! Long answer: This lie has an understandable origin. The most common use of the 1099-MISC form is a business letting a contractor know how much he received in income from them that year. However, that self-employment income will appear in Box 7. A lesser-known use of the 1099-MISC is in Box 3, Other income. This box would include strange sources of unearned income such as gambling winnings and prizes, payments for participating in medical research studies, punitive damages… and grad student fellowships. Having 1099-MISC Box 3 income does not mean that you are self-employed the way that Box 7 income would. However, it does clearly indicate that you are not an employee of your university. Fellowship recipients are neither employees nor self-employed with respect to that income; they are students or trainees. Some universities will not communicate with either the IRS or the fellowship recipient regarding the fellowship pay, and some will send only an unofficial ‘courtesy letter‘ to the recipient to alert her to the amount of her fellowship income. Some universities choose to report this non-compensatory income on a 1098-T. However, the purpose of the 1098-T is to help students and parents of dependent students claim a tax credit or deduction, so some people might disregard it if it cannot be used for that purpose (i.e., the amount listed in Box 5 is greater than or equal to the amount listed in Box 2, which is typical for graduate students receiving stipends). Likewise, reporting fellowship income on a 1099-MISC Box 3 is also an ‘off-label’ use of the form. While it is used for reporting awards and prizes, scholarship and fellowship income is not explicitly listed in the IRS documentation as a type of income that should go into Box 3. My guess is that universities most often use the 1099-MISC for reporting purposes because they have given the students the option of having taxes withheld from their stipends and they have to find a way to report the amount of federal and state tax withheld. The 1098-T reporting option does not allow for tax withholding, and therefore grad students are often compelled to file quarterly estimated tax. So the upside of offering grad students the option of having taxes withheld comes with the downside of using the 1099-MISC, which creates confusion over self-employment. Further ‘proof’ of the distinction between fellowship and self-employment income comes from IRS Publication 970, which specifically discusses the tax implications of scholarships and fellowships. Non-compensatory income that is in excess of the student’s qualified education expenses should be reported as income in line 7 of the 1040. Self-employment income, on the other hand, is tabulated on a Schedule C and then reported in line 12. Even the 1099-MISC form itself instructs people with Box 3 income to report it in line 21 (Other income) of the 1040, which is incorrect for fellowship income but at least avoids the self-employment designation (and will probably result in a proper tax calculation). At tax time and particularly when preparing your tax return, it’s important to be clear that you are not self-employed. People who are self-employed pay double the FICA tax that an employee does, whereas fellowship recipients are exempt from paying FICA tax on their fellowship income (and even if their fellowships were considered wages, they would have a student FICA exemption). Stay tuned for ‘lies’ 4 and 5 for more details on this topic! See the tax lies home page for a full list of tax lies that graduate students should not fall for. Emily Roberts presented a tax webinar for funded grad students and postdocs (US domestic) on March 9, 2018. Register for the webinar to receive a replay! While I agree with you that the 1099-MISC isn’t a great form for reporting fellowship income – there isn’t one, it seems – reporting fellowship income on the 1099-MISC isn’t technically in violation of this instruction because they are not “for teaching, research, or other services as a condition for receiving the grant.” Apparently the universities and IRS think that fellowship income doesn’t (officially) come with work strings attached, though in practice we all know it does. My son did not work in 2017. He only did research for school and received a 1099- MISC for stipend. The 1099-Misc amount was reported in box 3 and box 18? What is the right way to report this on his taxes? This post is going to be a lot more info than you need, but it does contain or link to the answer to your question. It very much depends on whether your son has qualified education expenses to claim (or if you are claiming them all if he is a dependent). Hi Emily, correct me if I’m wrong, but wouldn’t putting it “Other Income” be considered “Earned income”? This may be an issue with Fellowship/Scholarship amounts which aren’t considered “Earned Income”. I don’t think I recommended reporting fellowship/scholarship income as “Other income”…? I agree, it’s less ambiguous regarding the earned/unearned distinction to report it as fellowship/scholarship income. Therefore, do not report Fellowships on a 1099-MISC. To suggest that an institution can report a Fellowship on a 1099-MISC is against the IRS’s instruction and causes massive confusion to the taxpayer and the IRS if it is reported on 1099-MISC, regardless whether the income is reported on Line 3 or 7. Currently, I am dealing with a tax issue and its because the institution elected to improperly use the 1099-MISC for a Fellowship. Because the institution used the 1099-MISC, its triggered an IRS audit that suggests the taxpayer owes thousands more in taxes. I totally agree with you that reporting fellowships on the 1099-MISC is confusing to the recipient and sometimes the IRS. It’s easy to confuse fellowship pay with self-employment when using the 1099-MISC. The purpose of this post is to help students who do receive a 1099-MISC to understand it and pay the proper amount of tax. What did you do in this situation? I now owe over $4000 because my institution put my graduate stipend on a 1099-MISC. The IRS audited me and considered me self-employed, even though I reported this information on a 1040. It says my information and the information my institution provided “do not match.” Which claims I underreported almost $20,000. Thanks for your question! You should definitely push back against the IRS’s misconception. Where did you report the income initially – line 7 or line 21? If it was in line 21 you can offer to amend the return to report it in line 7. Perhaps you can get your fellowship source to write a letter as well. This blog post details the process that another grad student went through for a similar problem. Do I pay taxes on a 1099 misc for an award I got in college. The amount is in box 3. That type of reporting does indicate that the award is a fellowship/scholarship/grant and taxable. However, if you have qualified education expenses you can balance them against the scholarship to make it tax-free (see this post and Publication 970 Chapter 1). There may be other education benefits you can take to reduce your tax burden. Even if you exhaust all your education benefits, if your income is low enough, you won’t end up paying any tax because you can take standard deduction and an exemption (if you’re not a dependent). I have a 1099-MISC for undergraduate research stipends and the amounts are reported in Box 3. If I understand your article correctly, you’re saying that I owe no FICA taxes? Your situation fits the pattern as I understand it, yes. You received a fellowship grant (or some other type of non-wage pay) as your stipend, so that is not subject to (either side of) FICA tax. Your situation is a little outside of what I normally see because you may not have been enrolled as a student during that time/at that institution so you may not have qualified for the student FICA exemption, but as long as your pay is not wages that shouldn’t matter. In any case, if you had been self-employed the amount would have appeared in Box 7. 1099-MISC Box 7 indicates self-employment income. Did you arrange an independent work situation with the professor – not the typical route for TAs? Sign any contracts? This is highly unusual. If you had a very typical employment situation, this reporting may be a mistake. Follow up with the professor and the department about this. You do not want to be labeled as self-employed if you weren’t in reality because you’ll have to pay a bunch extra in tax. If you really were self-employed, just follow the 1040 instructions or software instructions for entering it. After you deduct any business expenses on Schedule C, you’ll report your net self-employment income in line 12 of the 1040 and also file a Schedule SE. This is different but related, I think. My daughter garduated in 2016 and got an intenship paid with a fellowship in the summer of 2016. She did not receive a W-2 or 1099-Misc.How do we report this? I plan to claim her as a dependent this year. I don’t know how her being a dependent changes the situation except that you can claim her educational benefits, but if you aren’t planning to make the fellowship tax-free (I’m not sure you can anyway because she was no longer a student) I guess that doesn’t make a difference. I got a grant/scholarship through an organization I am a part of. They sent a 1099 MISC with box 3 filled in with the amount. How do I file this, or do I file it at all? You should enter the amount in Box 3 as scholarship/fellowship income on line 7 of your 1040. You can also choose to make part/all of it tax-free if you have any qualified education expenses. I have the same problem, also my daughter received a 1098 T and this scholarship she won is in that total. What do I do. I had an 9 month internship which was a requirement to recieve my masters degree. While on the internship I was required to pay tuition to my school although I had no classes or other contact with the school. I was paid a stipend while at the internship and received a 1099-misc with the amount in box 3. Should this income be reported on line 7 or line 21 of form 1040? Also can this income be reduced by the amount of tuition I paid or just by the amount allowed in the tuition and fees deduction from form 8913? I would check with your internship that the salary you were paid was a “fellowship” or “scholarship” and if yes report it in Line 7. (My guess is that it is.) I think in that case you could also make part/all of it tax-free using your qualified education expenses. But if it’s not a scholarship/fellowship, it would go into Line 21 per the instructions. My son received a fellowship last year to go do research in Europe over the summer. We received the 1099-misc with no taxes withheld for those monies received. I started completing his taxes, filled in amount in box 3 and it calculated him owing a substantial amount of taxes (I tried putting the same amount in box 7 and the taxes owed came out even higher). He does have a part time job, not sure if that makes much difference, he received a sizeable scholarship for the previous year for just his schooling so I am not sure if he would have much deductions to offset this fellowship. How can he make this overage qualified education expenses? Or should he just go ahead an be prepared to start paying the irs because he didnt get taxes withheld? Just make sure that you enter this income as fellowship income and that you’ve accounted for all his qualified education expenses. It sounds like he simply owes tax on his income, which is pretty normal to expect. And what is your opinion about whether the student mentioned here would be allowed to deduct per-diem travel expenses while away from home in Europe, against his 1099MISC box 3 income. Well, if we’re going off the premise that this is fellowship income, travel and research expenses are not allowed qualified education expenses. Emily, have you considered whether reporting the 1099-MISC income on line 7 is more likely to trigger an automatic underreporting notice than reporting it on line 21? We just got one of these notices (CP2000) for 2015 even though we included all our fellowship income on line 7 with the SCH designation. A large chunk of that money was reported to the IRS in Box 3 of a 1099-MISC. The IRS therefore thinks we didn’t report it at all and is asking for back taxes and interest. Overall it seems better to deal with this problem than with the other problem of putting it on line 21 and risking it being treated as self-employment income. But man, it is really frustrating to be stuck in this situation. Your case is the first I’ve heard of anyone having trouble with Line 7 reporting, and I’ve had several reports of problems with Line 21 reporting (e.g., Winning a Fight with the IRS). So anecdotally on balance Line 7 seems better?? No real data though. I’m sorry you have to deal with this! It seems like you’re on the right track. Just keep on explaining to the IRS that your fellowship income was reported on the 1099-MISC and you accounted for it in line 7; I’m confident you’ll come through it with only time lost. If you have a chance, ask where they would have wanted it to go if not there and let me know! My daughter received a 1099-MISC for $2000, reported in Box 3. The income is from an internship by which the university requires their graduate students to do for her particular masters program, Counseling. Her internship is completed on site at a counseling office and she is required to be under the supervision of a licensed Counselor. This office gives all of the interns $10 per counseling session. Should this income be reported on Line 21 as Other Income. She also used this money toward her tuition, books and supplies. She also received a 1098-T from her school and this income is not accounted for on the 1098-T. I think your daughter should inquire from the university and/or counseling office whether this income can be made tax-free using qualified education expenses (i.e., it is a scholarship, fellowship, grant, etc.). If it can be, it is best reported in Line 7 with “SCH” written next to it. Line 21 is also acceptable for reporting, but it might result in higher tax due overall depending on what other types of income she had. Thanks for this great post and for all of your replies to the previous comments – they have helped my thinking on this so far! I have a question of my own. I had income from my university, as well as income from a fellowship that was reported on a 1099-MISC in box 3. I am using turbo tax to prepare my return. As predicted from this post, the software is routing me through a “self-employed” section, and the income is getting reported in box 12 as “business income.” If I am understanding this post correctly, what i want is for this to be reported instead in box 7, along with the money I received from my university. 1. Is this correct? and 2. Do you know how to do this with a tax software? Should I just try to report it with my other W-2 income and look for a box that says I didn’t actually receive a W-2? I am so confused! Hi Emily! I’m on a student visa (F1) and received $2200 from an organization I interned with. I was issued a 1099 Misc form ( amount was under box 3), but later I was informed that I shouldn’t have been issued a 1099 Misc in the first place because this income qualifies as fellowship/grant/stipend and is not reportable to the IRS. Now I’m confused. Should I report this amount while filing my taxes? I’m guessing they mean THEY weren’t required to report it to the IRS, not that they were telling you not to. You should treat it like any other fellowship income, i.e., include it in your income unless it went toward paying qualified education expenses. In my sons case having the income from 1099-misc show up as unearned income causes a kiddie tax issue. It isn’t unearned income, is it? It is a stipend/fellowship to give up 8 weeks of his summer time. The tax code is nuts and keeps getting worse. I recently researched this and yes stipend income is unearned and can trigger the kiddie tax. Hello! I’m really struggling with my 1099 MISC and was hoping you could offer advice. I’m a teacher and receive salary supplements from my grad school at the end of each semester. This is part of the fellowship award I got when I first enrolled. However, I also worked for my grad school last summer, separate from my fellowship. My grad school sent me a 1099 MISC reporting $20,000 in box 7. $10,000 comes from the stipend and the other $10,000 comes from the unrelated summer work. I’m really struggling with how to handle this, since I don’t want the $10,000 of my stipend reported as self-employment income. That is a difficult one and an unusual situation! I’ll take you at your word that the fellowship stipend is not self-employment income, though a salary supplement is not a situation I’ve seen before. My answer assumes that the work you did over the summer was legitimately self-employment income since you aren’t objecting to paying SE tax on that half. Ideally you would have received two different reporting mechanisms for the two income sources. You can still ask your grad school to produce the documentation in two ways, although I’m not optimistic that they will comply, and certainly not before tax day. 1) File as the IRS would expect you to, paying SE tax on the full amount, and then amend your return when you receive new documents. 2) File the way you believe to be correct without paying SE tax on your stipend, and expect the IRS to argue with you. However, by then perhaps you will have new documents, some kind of statement from your grad school, or at least a cogent argument. Each way is risky. If the IRS doesn’t buy your argument, you might not be able to get your overpayment back in the first scenario and be charged fees for late payments in the second scenario. If your grad school won’t work with you, this might be worth paying a professional to sort out. I received a 1099-Misc for 2017 with $1000 in box 3 only. This was awarded as a research scholarship. I have no income/employment at all for that year. I filed just to show my 1098-T and $0 income for that year. Do I need to amend now to include this 1099-Misc amount? There is nothing listed in line 7 and I was never self-employed. I don’t think you were/are required to file a return in 2017, but you should use this quiz to check.